Software, microphone preamps, signal processors, digital audio interfaces, mixers, and control surfaces. Start recording today with this complete, all-PreSonus® package! 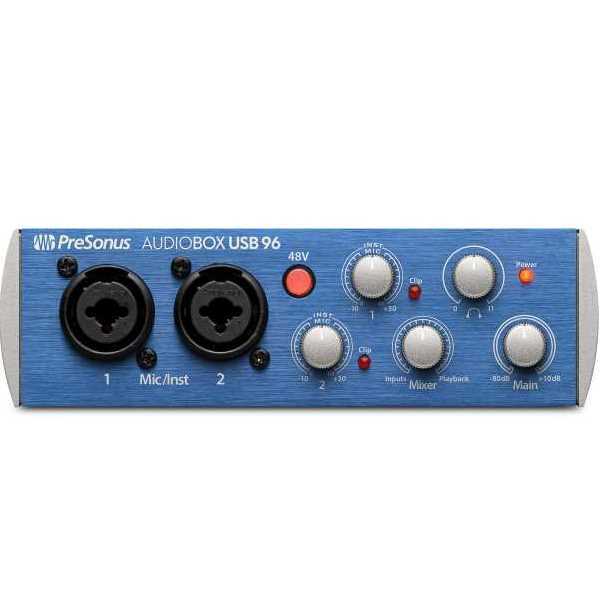 Based on the AudioBox USB® 96 audio/MIDI interface and award-winning Studio One recording and production software, PreSonus AudioBox 96 Studio is great for creating multitrack recordings, demos, live recordings, podcasts, field recordings for video and sound effects, and much more. Whether you are a musician, producer, or podcaster on a tight budget, the AudioBox USB® 96 audio interface is for you! This simple, handy little audio/MIDI interface has just the right features for basic recording needs, allowing you to plug in and start recording up to 24-bit, 96 kHz audio right away. Bus-powered and built to travel, the AudioBox USB 96 makes recording easy. Great for home recording, mobile musicians, guitarists, podcasters, and live streaming, the Studio 24 2×2 USB-C bus-powered audio/MIDI interface can record up to 24-bit, 192 kHz audio. Equipped with PreSonus XMAX-L solid-state preamps and high-end converters, it delivers professional quality audio in a rugged, compact enclosure, allowing you to create your next hit in your studio or on the go. A complete, all-in-one recording solution, the Studio 24 comes with PreSonus’ award-winning Studio One® Artist music production software for Mac® and Windows®.